Yeh Rishta Kya Kehlata Hai Spoilers: Naira and Kartik Patch Up After Having Bhaang; Naksh and Kirti Apologise To Everyone! 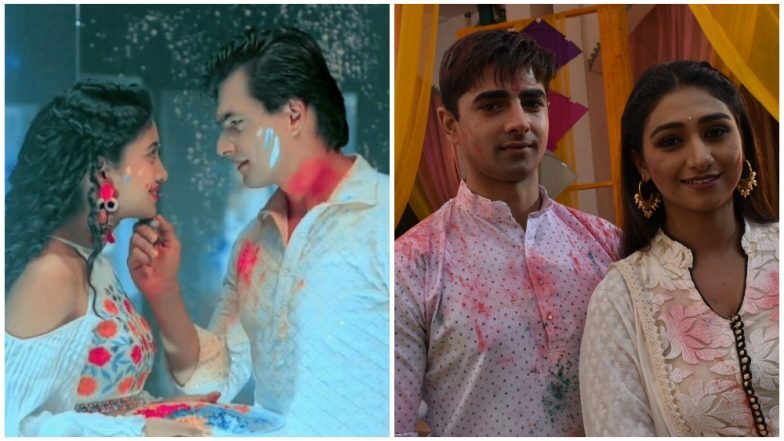 Star Plus' Yeh Rishta Kya Kehlata Hai is currently focusing on the re-marriage of Kartik (Mohsin Khan) and Naira (Shivangi Joshi), which has come to a standstill. With Kirti (Mohena Kumari Singh) voicing her insecurities to Kartik, he decides on not marrying Naira, so as to save Kirti and Naksh's (Shehzad Sheikh) marriage. Kartik informs Naira of his decision and this leads to Naira's huge breakdown and Naksh promising to find Kartik and punish him. However, before any revenge drama begins, things will fall into place, courtesy, Kirti. Yeh Rishtey Hain Pyaar Ke March 21, 2019 Written Update Full Episode: Kunal-Abir and Kuhu-Mishti’s Families Want To Get Them Married! Kirti will witness Naira's breakdown and then confess to Naksh that Kartik's decision is because of her confession. She then tells Naksh about how his behaviour has put her on the back burner. Naksh realises his mistake of not giving his wife importance, and so does Kirti, that Naira is not to be blamed. When the families meet on the ocassion of Holi, Naira ignores Kartik completely, despite the latter's best efforts to talk and apologise to her. Both the families try to bring them together but Naira snubs everybody's efforts. Also, the show will see Gayu and Samarth's return to the show and the duo too will be seen trying to patch Kartik and Naira up. However, circumstances lead to the duo consuming bhaang thandai and they both forget their problems for some time and dance. On the other hand, Naksh and Kirti also decide to start afresh. However, the question that remains to be asked is whether or not will Naira forgive Kartik.